I’m in the proces of creating our company’s Windows 10 new reference image so this information is really usefull. Will you blog about the other tips & tricks you mentioned before? Thanks… in Windows 7 I was able to customize the settings for default users when they logged on for the first time (with copyprofile.xml). I wonder how that is implemented with Windows 10 when creating a reference image. You can’t make changes to the default file associations in this way since Windows 8.1 – so using copyprofile will fail in that the changes will be reset / not recognized. 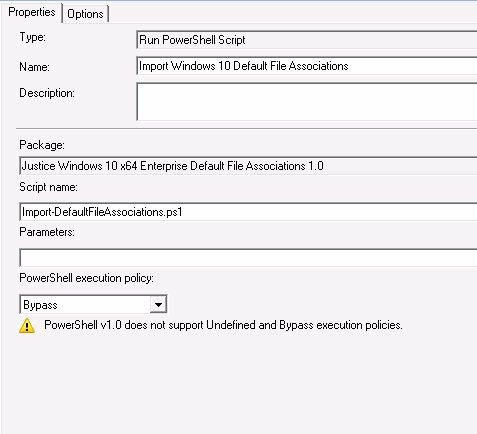 There is no workaround for this and is in part why there is a powershell module to inject the changes into the Operating System now. Damn, I got excited when I found this post. I was hoping this would work in a W10 ENT Build 1511 after capturing and deploying a custom WIM using COPYPROFILE=TRUE. Our image is so static and we use Faronics Deep Freeze to keep it that way, so we a new profile is generated each login. Has anyone found a work a round? Reg hack maybe during a login? RunOnce registry entry perhaps? Good site btw. 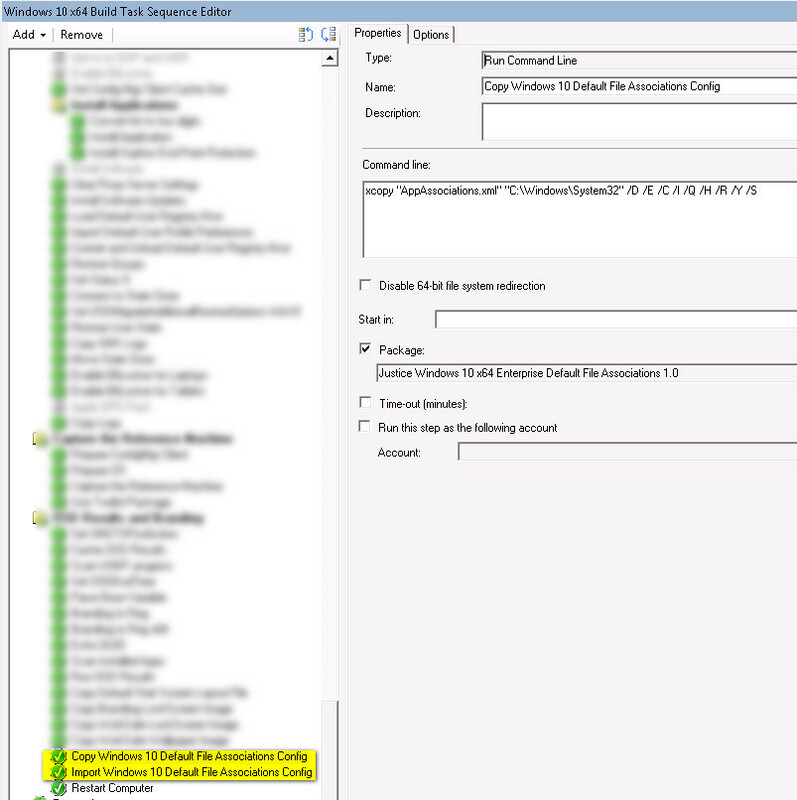 Its just calling a DISM command so you should be able to do this with MDT. I’ve updated the script I use now to Powershell. You could try the following? Just be aware that Microsoft added a change to how Windows 10 handles default file associations in one their cumulative updates. A lot of people have reported that some file association settings revert back to the default ones at first login. This happens sometimes but not always and seems to relate to how the new application is changing the default file type in Windows 10. There isn’t a fix at the moment however I’ve found that removing the modern application seems to help i.e if you were changing the default photo application then removing the modern application as part of the OSD process will stop the file type reverting back. This works great for me on 1607 with a new machine. In-place upgrade is problematic, though. With IE being set as the default, at first login the user is prompted with choosing how to open HTML, Edge or IE. It doesn’t do this with Adobe Reader being the default with PDF’s, though. They REALLY want us to use Edge. Yes there are still quite a few issues with in place upgrades, application defaults being one of them. One thing that we have confirmed is that you need to export the full list of file type associations and do a full import of that list using dism. Messing with the list causes problems. Thanks for the idea, importing a unmodified .xml. Clearing out ‘un-needed’ entries in the .XML file generates a ton of Action Bar notifications for app associations being reset. The solution I found: Create the .xml export as you already have, do not edit out lines of information. Import the untouched .xml into your deployment sequence. Importing an edited .xml worked fine with the RTM build. I skipped v1511 and started working with v1607 when I noticed this behavior. Further testing proved importing the unedited .xml address the Action Center notifications. Downside, maintaining different .xml files if you give different areas different app preferences. I am in the process of creating an image as well. This stuff is irritating. I would like to have the application installed later on the first user login? And then script the default association. Is it possible to do this? I got it successfully to work when the application is pre-installed and then applying the dism command. But just wondering if there are other ways. The application is a web browser. Does the above method 1 and 2 still work. I’m using my deployment system Dell KACE K2000 and I’m having problems with Windows keeping the associations. It seems that after I apply the OEMDefaultAssociations and login to the computer as a new user see the popups reset the Associations back to the Microsoft defaults. Do this process still work after that February patch bug? I have KB4013429 March 14, 2017 Update slip-streamed in with my WIM file. Apologies for the late reply. 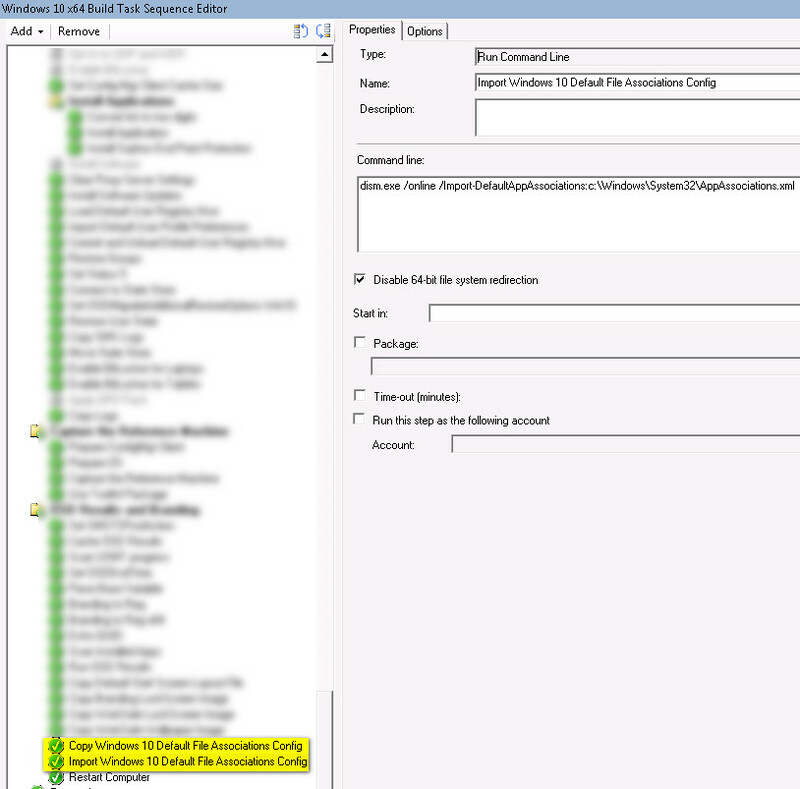 It works great with new user profiles, however I see the same issue as you with profiles that are migrated in my environment using USMT. I don’t have a workaround for this accept to manually set the defaults for users when we migrate them from Windows 7. The problem doesn’t occur when you migrate from Windows 10 1607 to Windows 10 1703 using in place upgrade as that retains existing user app defaults without resetting them.